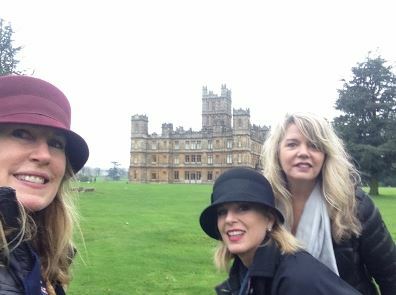 We are diehard Downton Abbey fans and have romanticized about visiting Highclere Castle, the filming location for this popular PBS television series. Highclere Castle is one of England’s most beautiful Victorian castles, often visited by locals and guests all over the world. Our dream finally came true! We booked our tickets to visit the castle at this link, click here! After planning a trip to visit the English countryside, our daytrip to Highclere Castle was definitely a highlight. Here’s a glimpse into our visits last year, and recently this May. Upon arrival to the estate gates, we entered and our chauffeur from Ryan James Chauffeurs, drove us through acres of beautiful countryside to the path that leads up to the castle door. It’s as beautiful as it appears on TV! It was as if we traveled back in time as we made our entrance through the gigantic front doors, and set foot into this famous castle. Highclere Castle has served as the Carnarvon family home since 1679. Inside Highclere Castle, we met Lady Carnarvon who graciously welcomed us next to the iconic large fireplace in the main entrance. Countess Carnarvon is beautiful, and surprisingly “down to earth”. She has a wonderful way about her that makes you feel at ease. Her responsibilities and duties are many, including welcoming royalty and hosting charitable events. Yet she took a few minutes to visit with us and autographed her latest books, NY Times Bestsellers – ‘Lady Almina and The Real Downton Abbey’ and ‘Lady Catherine and The Real Downton Abbey’. During our tour, we were in awe at the architecture, the stately rooms and the centuries-old works of art and antiques. When you visit Highclere Castle, leave plenty of time to stroll through the magnificent gardens and some of the 1,000 acres of forests. Don’t Miss! Be sure to visit the permanent Egyptian exhibit honoring the fifth Earl of Carnarvon’s discovery of King Tutankhamen’s tomb with his archaeology partner Howard Carter in 1922. 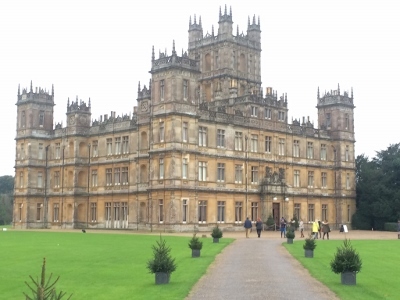 Book your tickets to visit Highclere Castle/”Downtown Abbey”, click here! Note: the Castle, Gardens and Egyptian Exhibition are open at various times throughout the year. Ryan James Chauffeurs provides luxury chauffeur services. We experienced their excellent chauffeur service from Cliveden House to our Four Seasons Hampshire Hotel. Also, we were chauffeured by Ryan James Chauffeurs from our Four Seasons Hampshire Hotel to Highclere Castle the next day, and then returned us after our visit. For private chauffeured services, we recommend Ryan James Chauffeurs – professional, cordial, and punctual. We flew Delta this trip on a direct, non-stop flight from Seattle, USA to London Heathrow. The captains and crew were fabulous! 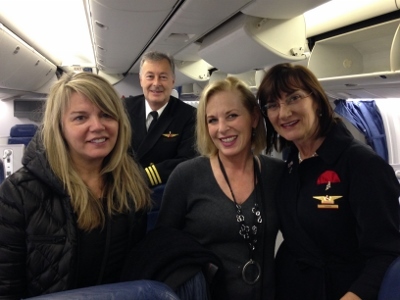 Want to call out Monica Augustyn, Head Purser, and our chief flight attendant on this Delta flight. Her level of service is superb! She ensured we were comfortable throughout the flight and our needs were quickly attended to. She “raises the bar” for all airlines and flight attendants on how to deliver superior customer service. 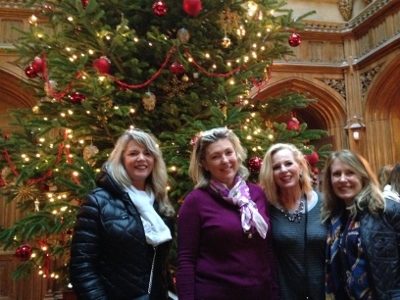 Global Adventuress thanks the following who hosted us during our visit to Highclere Castle – Lady Carnarvon and her fantastic team at the castle. Also, we want to thank Ryan James Chauffeur Services for chauffeuring us to our destinations in the English countryside and escorting us to Highclere Castle. 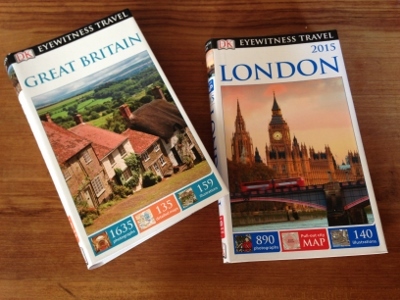 As always, we appreciate DK Travel for providing us with the Great Britain Eyewitness Travel Guide Book with 1,635 photographs, 135 detailed maps, and 159 illustrations to help us plan our trip, as well as the 2015 London Guidebook with 890 photos, 140 illustrations and a pull-out city map. Interested in going to England? Let us know if you need help planning a customized trip. Want to see more of the Downton Abbey Filming sites? Check out this map put together by Wayfair.co.uk and see them all!